I have to admit that I entered this game in the Jordan Challenge with a fair amount of confidence, after managing to put up 69 points and six assists while shooting better than 50% in The Arrival. I figure I know what I’m doing by this point: get six quick assists in the first quarter, then get the ball to Michael Jordan in the midrange, pump fake, and drive it in for the dunk or layup, with a few And One plays no doubt helping to pad his numbers. I’m just glad that I don’t have to get 18 rebounds! Anyway, as it turns out, I may have been a little overconfident in my strategy. 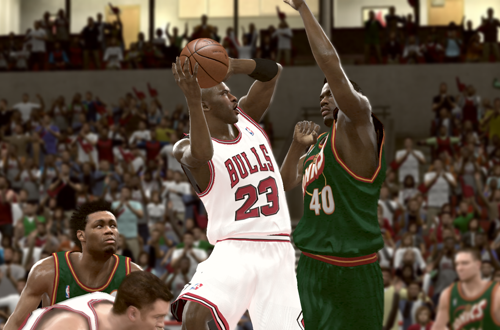 The challenge starts out reasonably well, with Horace Grant knocking down a midrange jumpshot for MJ’s first assist of the night. The ’90 Cleveland Cavaliers are actually putting up a better fight than the ’86 Boston Celtics however, and I botch several attempts at picking up the next five dimes. The early lead for the Cavs is also concerning, since unlike The Arrival, I need to win the game to complete the 69 Points challenge. I do get MJ his six assists by the end of the first quarter, but scoring looks like it will be a bit tougher, with Craig Ehlo and Mark Price keeping in step with His Airness. I’ll admit that I’m a bit frustrated at this point. Perhaps my biggest problem is missed free throws. MJ is getting to the line, but I’m often going one-for-two on each trip, consistently getting a slightly early release, along with the occasional perfect one. It’s really making me miss the Shot Meter from the past few NBA 2K games. MJ has 24 at the half, and as I’ve done with my other recent attempts at the Jordan Challenge, I decide to save the game so that I don’t have to start over from the beginning if I come up short. I save again at the end of the third quarter, at which point Jordan has scored 42. The points haven’t been coming as easy as I’d hoped, and with eight minute quarters, I can see it going down to the wire. Fortunately, I’d taken control of the game by the fourth quarter, but between missing some more free throws, a couple of cheesy turnovers, and plain old misses, I started to feel like I would need a do-over this time. 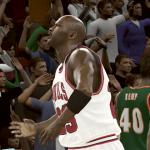 With 2:58 remaining, MJ scored his 60th point, so I decided to save once more. He had 66 at the 1:41 mark, but I opted to play it out without saving again, and take my chances if I needed to start over from 60 points. After a couple of miscues, it looked as though I may come up just short with 68, but threw down one more dunk with 18.9 left to give MJ a final stat line of 70 points on 26-for-42 shooting, eight rebounds, and eight assists. Challenge complete! Like a couple of games in the 1991 NBA Finals challenge, I found this contest to be an odd mixture of fun and frustration. Some of the AI’s psychic steals, the missed free throws, and exaggerated foot-speed of players like Ehlo really frustrated me, but I also relished the challenge and enjoyed making the highlight plays. At this point, I’m also admittedly feeling a bit of impatience about finishing off the Jordan Challenge, which makes it harder to get caught up in the moment. If this were still 2011, and I didn’t have a newer NBA 2K game to get back to, I might feel a little differently. 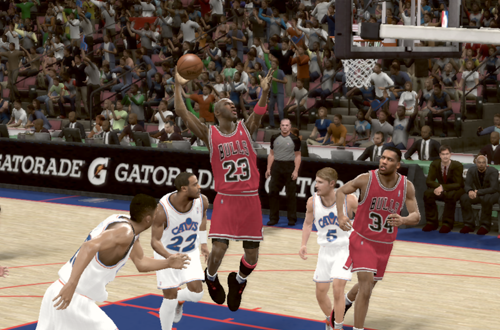 That being said, I’m still glad that I decided to go back to NBA 2K11 and do this. I’ve left this game in the Jordan Challenge alone until now because I could see it being one of the most difficult, or at the very least, one of the most frustrating. 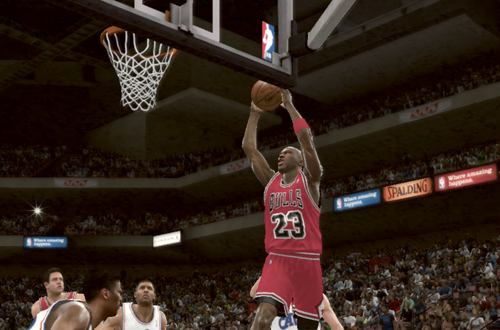 I’m not too worried about winning the game, as the ’96 Chicago Bulls have the players to get the job done. The 22+ points should be easy as well, with no field goal percentage requirement, and a much lower total than the other games in the Jordan Challenge. The seven or more assists should also be pretty simple, and since I don’t need to score as many points with MJ in this one, there’s less of a rush to rack them up as quickly as possible. No, the toughest part of this challenge is grabbing nine or more rebounds. Rebounds are much harder to manufacture than points and assists, relying on misses, good positioning, and no one else snatching them. Attempting to get the seven rebounds in The Flu Game showed me how Scottie Pippen and Dennis Rodman are likely to steal boards from me when I try to clean the glass with MJ, and this time I need two more. I figure that I’m definitely going to have to put Jordan at power forward or centre for a few stretches, to make sure that he’s in position to snare a few more rebounds than usual. Still, I hope he’ll get a few of them organically. It’s a sloppy first quarter, and my attempts to crash the defensive glass with MJ leave Hersey Hawkins open for one too many good looks. He scores 11 in the first, and the Supersonics get out to an early lead. On the bright side, MJ has nine points, three rebounds, and three assists heading into the second quarter, and I haven’t even had to put him at centre yet. I tighten up my defense in the second, while continuing to put the ball in Jordan’s hands. His 11 points and four assists in the period help take control of the game, and he also grabs three more rebounds. His 20 points, six rebounds, and seven assists are close to hitting all three goals, and the Bulls lead. I save the game. 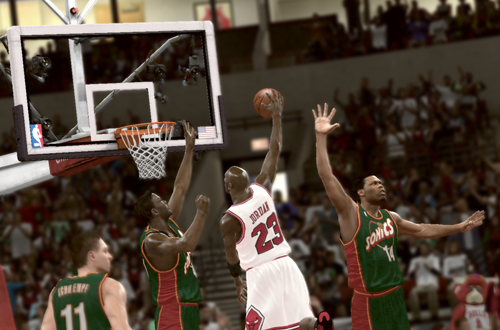 A dunk nets MJ his 22nd point of the night, achieving two goals with plenty of time to spare. I decided to move him over to centre, where he squares off against his college teammate, Sam Perkins. MJ gives up some height to Big Smooth, but the bigger issue is that other players are now snagging the boards instead of him; it seems the challenge was going better when Jordan was at his regular position of shooting guard. Despite giving up a couple of open threes to Perkins, the strategy eventually pays off. Saving again shortly after picking up MJ’s eighth rebound, he gets his ninth in the waning minutes of the third. Now all I have to do is win the game. With all of the statistical requirements fulfilled, and a double-digit lead, I feel very relaxed heading into the fourth quarter. I decide that I’ll risk not saving the game again, and just have some fun for the final eight minutes. This mindset leads to me getting a little careless though, and the Supersonics cut into the deficit as a result. I quickly settle things down, and ultimately the game is never in doubt. The Bulls win 82-65, which isn’t too far off the real score of 87-75. Funnily enough, MJ gets three more rebounds in the fourth, finishing with a triple-double of 43 points, 12 rebounds, and 13 assists, shooting 17-for-23 from the field. It’s funny how I expected this to be one of the toughest games in the Jordan Challenge, yet it actually turned out to be one of the easiest. All of the statistical marks were achieved by the end of the third quarter after coming close to reaching them by halftime, and nine of MJ’s twelve boards came while he was at shooting guard. I definitely had to force things a little to get the 9+ rebounds though, so I’m not sure how successful I would’ve been if I’d tried to let it happen more organically. I guess it doesn’t matter though, as the challenge has been completed, and there’s only one remaining. 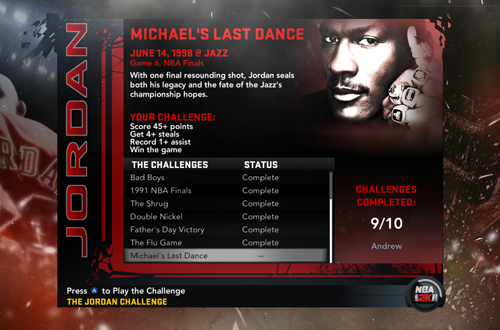 That last challenge is, appropriately enough, Michael’s Last Dance: the title-clinching Game 6 of the 1998 NBA Finals, and the final game of Michael Jordan’s Chicago Bulls career. Unquestionably a memorable game, it also poses a difficult challenge in NBA 2K11, mainly because of the goal of getting four steals. Still, I’m going to have to do it if I want to finish the Jordan Challenge, and unlock MJ: Creating a Legend without using the code. Join me next week for the final part in this series, in which I’ll give it my best shot! Thanks for the kind words, glad to hear you’re enjoying the articles! The psychic steals are definitely problematic in NBA 2K11. I’ve found that faking passes helps a little, as does being really, really careful, but even so there are a few too many deflections and interceptions. I only had a few of the signature animations trigger for me in a couple of the challenges, so I’ve noticed that too. I was looking forward to seeing them, recalling all the great work that MessenjahMatt did with his videos all those years ago. I believe you have to really be specific about how and when you complete some of the objectives, which makes sense, but is a little disappointing all the same, because that’s not always feasible.